The Qilian Orogen in the northern margin of the Tibetan Plateau is the northernmost of the Tethyan domain. Abundant ophiolites record the closure of an early Tethyan ocean and amalgamations between micro-continents of North China, Qaidam, and Tarim. The Muli arc–ophiolite complex in the western segment of the South Qilian belt represents remnants of the Proto-Tethyan oceanic lithosphere. It comprises serpentinite, dunite, cumulate gabbro, basalt, plagiogranite, and chert, which are in tectonic contact with Upper Ordovician turbidites. Basalts have typical subduction-related calc-alkaline geochemical affinity, representing portions of an island arc. 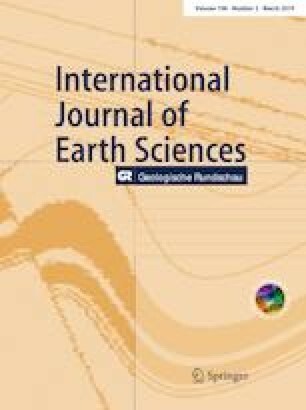 Geochemical results for plagiogranites and spinels from serpentinite indicate that the Muli arc–ophiolite complex represents a super-subduction zone (SSZ)-type ophiolite. U–Pb zircon data indicate formation associated with southward subduction of the Proto-Tethys Ocean during a short interval between 539 and 522 Ma. Results of petrology, geochemistry, and zircon U–Pb dating demonstrate that granitoids intruded into this complex are Middle to Late Ordovician (470–450 Ma) products of subduction-related arc magmatism. Voluminous Late Ordovician–Early Silurian rocks include deep-water marine siliciclastic and volcaniclastic turbidites and abundant volcanic arc rocks located to the south of the Muli arc–ophiolite complex, whereas fluvial coarse-grained sandstones and conglomerates unconformably overlie the Cambrian–Middle Ordovician ophiolite–arc systems in the eastern South Qilian belt. This indicates that closure of the Proto-Tethys Ocean was diachronous during the early Paleozoic. The online version of this article ( https://doi.org/10.1007/s00531-019-01699-6) contains supplementary material, which is available to authorized users. Support for this work was provided by the National Natural Science Foundation of China (Grants 41872241, 41672221, 41702239) and the Geological Survey Program of China (DD20190006, DD20160201-04, DD20160022-02). We are grateful to Editor Wolf-Christian Dullo, Associate Editor Soumyajit Mukherjee, reviewer Ramananda Chakrabarti, and two anonymous reviewers, whose critical comments and constructive evaluation have significantly improved the quality of the paper.